Leslie Odom Jr is an American actor who has appeared in many movies and TV shows, although it was in the theatre that he started his career in 1998 with Rent. Apart from the stage and screen, he is also a singer who has thus far released two albums. Because of his name, there are many people who believe that he is related to Lamar Odom, but is he? Find out below. On August 6, 1981, Leslie Odom Jr was born in Queens, New York City. However, it was in East Oak Lane, Philadelphia that he was brought up where he attended the Julia R. Masterman School before later moving to Philadelphia High School for Creative and Performing Arts. For his college studies, the actor went to Carnegie Mellon University where he studied musical theatre. He started singing as a child being a member of the Canaan Baptist Church choir where he sang solo for the Germantown church. As regards his acting career, it was his 5th-grade teacher that started it all for him when she had him enter for a writing and reciting speech contest. From there he got an art scholarship which introduced him theatre. Leslie Odom Jr began with a role in the Broadway, Rent in 1998 when he was only 17. This was then followed by another Broadway, Dreamgirls. From then on, he had many other appearances with his biggest coming in 2015 when he played the villain of early American history, Aaron Burr in Hamilton. His performance in the production earned him the respect of a lot of people including the likes former US President Barack Obama and sensational singer Beyoncé. More to that, his portrayal of the character landed him a Tony Award for Best Actor in a Musical and a Grammy Award for Best Musical Theater Album. Away from the theatres, Odom has also appeared in a number of films such as Scarecrow Joe (2007) and Murder on the Orient Express in 2017. He has also appeared in many TV shows like CSI: Miami (2003 to 2006), Poe (2011), Smash (2013), and Law & Order: Special Victims Unit (2013 to 2015). As a musician, Leslie Odom Jr has released two albums, Leslie Odom Jr. in 2014 followed by Simply Christmas (2016). Although he has not recorded as much success with both jazz albums as some may expect, he still did well peaking at number 1 on the US Jazz chart with his first album while he was at 31 with the second album. 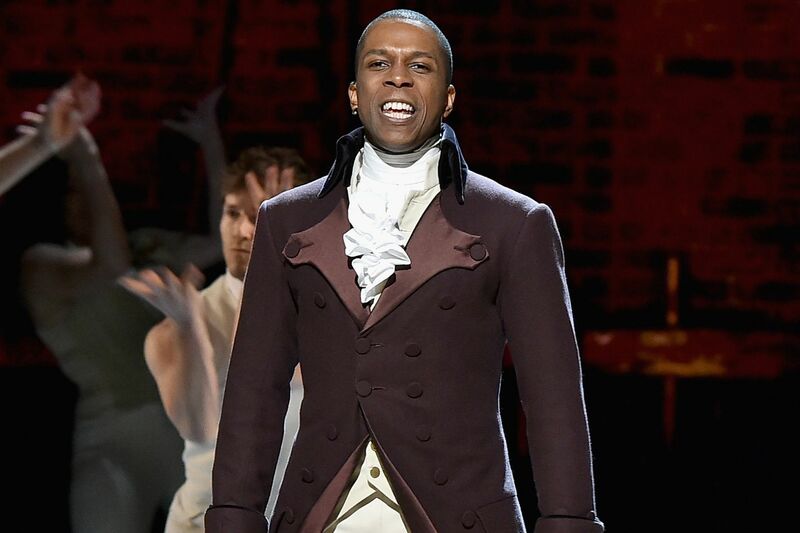 Before his breakthrough with Hamilton, Leslie Odom Jr was said to have had a contract worth half a million but that would have taken him off the TV show, so he turned it down. A highly successful actor and singer who has performed before the president of the United States and the First Lady in the White House, Leslie Odom, Jr. has come a long way that it will be easy for one to bet that he has a great fortune. Although his actual net worth is still unknown, there is every reason to believe he is doing great for himself and better than he would have been if he had taken the $500,000 contract presented to him. While there are many things about the actor that are known, the names of his parents still remain in the dark, although he described his mother as a very strong woman in an interview. He was raised alongside a younger sister. On the side of his family life, Leslie Odom Jr is a married man. He tied the knot with Nicolette Robinson in 2012, four years after they first met in 2008 at the audition for the musical Once on This Island in which Odom was an assistant director. Also a stage and television actress like her husband, Nicolette was still a student at the University of California, Los Angeles (UCLA) when she came for the audition of the role. Because of some events at the time, it fell on Leslie to help put her up to date. Soon things progressed from there and when the show ended, they began dating before finally getting married in 2012. Their union has been blessed with a daughter, Lucille Ruby who was born in 2017. According to Leslie, his wife has remained his best friend and greatest teacher. Apart from just being husband and wife, they have also done some little work together such as workshops and music, although they are yet to have a full production together. Is Leslie Odom Jr Related to Lamar Odom? Inasmuch as people have always wondered if Leslie Odom Jr is related to Lamar Odom, there are no records to show that the actor and the retired professional basketball player have any relationship. From all we can gather, the only thing they share is a similar last name.